Although officially Fairhaven United Reformed Church, this church is known locally as The White Church. The story of the White Church begins at a meeting of the congregation of Lytham Congregational Church in 1899 with the suggestion that there should be a new church in Fairhaven on the estuary of the Ribble on land leased by the Clifton family of Lytham Hall. A month after the proposal was made they received great encouragement for their vision. The Congregational Union of England and Wales had commenced a fund to raise half a million guineas for church extension… ‘in view of the rapid increase in population’. Now there was no stopping them and with scarcely a setback they began raising the money that would be required to build the new church, a church which they all agreed should be a distinctive architectural feature in the district (and it is!). Four firms were chosen to submit designs. The successful architects were Briggs, Wolstenholme and Thornley of Blackburn who won with a design that imitated some of the features of Byzantine architecture (on the outside that is). 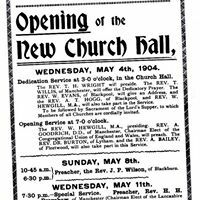 When the church was opened on October 17, 1912, eight years after the opening of the new church hall on May 4 1904, their vision was realised. The White Church remained Congregational in churchmanship, that is self-governing, until 1972 when it became one of the congregations of the United Reformed Church, a union of Congregational and Presbyterian churches.